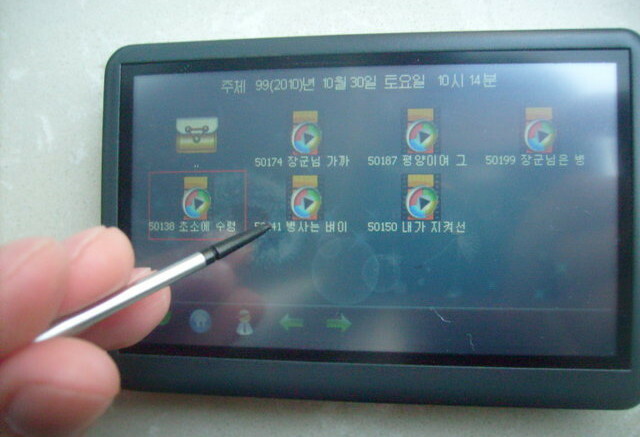 North Korean shops have begun selling a new PDA (personal digital assistant), according to the blog of a Russian studying in the country. The Pyongyang Show and Tell blog, which also introduced us to Red Flag Linux, has some pictures of the PDA and a few technical specs. It appears to be very much in the style of the PDAs or multimedia players that were popular in the early to mid part of the last decade. There’s no branding on the case that’s visible from the images. I contacted the student, who doesn’t want to be identified, and asked him a little bit more about the PDA. You can see his responses in my story at PC World. I’ve also got tech highlights of the PDA in story. You can see the full blog posting here (in Russian) or here in English (with Google Translate). Comparing the two (Hana 21 pictured right) the 2003 model looks much more like a PDA in the style of the Palm Pilot or its competitors. The new model has a more minimalistic face and no buttons. It’s perhaps more influenced by multimedia players or tablet PCs. The Hana 21 was supposed to target not just North Koreans but also South Koreans and Korean residents living in Japan, according to an article in the Japan-based The People’s Korea newspaper. I’m not sure if it ever went on sale. I never saw any mention of it, except in news reports from 2003. PDAs went out of fashion when smart phones began offering the same functions combined with data networking. Perhaps the launch of this PDA means a smart phone isn’t too far behind for North Korea’s 3G network.